Despite being a self-proclaimed book geek, I have a rather embarrassing confession to make: I have never read Jane Eyre nor seen any of the various screen adaptations. In fact, I've done a really good job of living under a Charlotte Brontë-shaped rock, as I knew little about the story before watching the innovative production currently gracing the boards at the National Theatre, which in turn is an abridged adaptation of the two-part version staged at the Bristol Old Vic last year. This re-imagining, which runs at 3 hours and 15 minutes, of the classic novel is a hugely imaginative and compelling one and does an admirable job of making the complex and lengthy story accessible to those not yet familiar with it. Chronicling the life of protagonist Jane Eyre (Madeleine Worrall), it's depicted in five distinct parts that run from her birth right down to her becoming a mother herself. In between she faces endless hardships; at her family home where she's severely bullied by her cousin and aunt, at the religious institution she's sent to at a young age and even when she believes she has found emotional and intellectual fulfillment she uncovers a terrible secret that severs the fragile romance with her Mr Rochester (Felix Hayes). The story of spunky orphan Jane Eyre is a gripping one in its own right, there is a reason it has captivated readers for over a century and has received countless adaptations in a range of media since, however this theatrical version is something special on an entirely different level. The staging is simplistic with a minimalist industrial set design encompassing a three-man band that form the sole instrumental accompaniment to the play, which are complemented well by the haunting vocals of Melanie Marshall (who plays an unexpected role in the production as well, which I won't spoil as I thought it was a fantastic reveal). The plain set design puts the focus on the actors, giving them nowhere to hide, and it was a thrill to watch Madeleine's Jane visibly grow from a petulant and misunderstood child into an accomplished and intelligent young woman. Felix's Rochester was excellent as well, being just as broody and mysterious as you'd expect him to be. But it were the astonishing performances of the supporting cast, who doubled up on roles and swiftly moved from children to a range of adult and even animal characters, that made this absolutely mesmerising to watch. I was particularly enamored by Craig Edward's enthusiastic portrayal of Rochester's canine companion and Laura Elphinstone's turn as the young ward Adele. 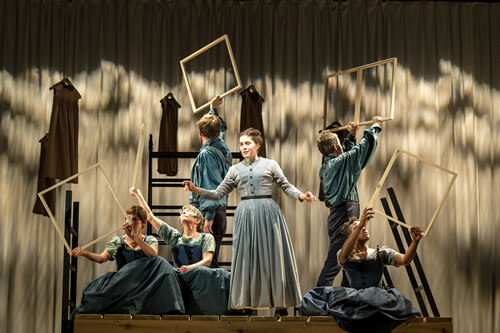 While this may have foremost been the tale of Jane Eyre, it is the collaborative execution of the entire company that made this such a remarkable play. For all the simplicity that rippled through this production, the overall appearance was anything but. Director Sally Cookson's re-imagining of Jane Eyre is an innovative piece of theatre that lingers on the boundary between a straight play and highly physical performance art, while the anachronistic musical support added an ethereal element to what was already an incredibly imaginative retelling of the classic novel. Jane Eyre is running at the National Theatre until 10 January 2016. You can book tickets here.